Open this article and click here to see a great little video of some of the atttactions and scenery in store for you. 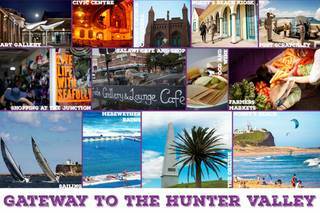 When you come to Newcastle make sure to leave some time to enjoy some of these wonderful features of the region. Newcastle is a cosmopolitan harbour city located just two hours north of Sydney, right on the doorstep of the beautiful vineyards of the Hunter Valley and the pristine waters of Port Stephens. Here you'll find spectacular beaches, hip bars, quirky boutiques, world-class restaurants and a booming arts scene. And that's not all. As Australia's second oldest city, there's plenty of fascinating historical sites and stories to discover, and surprises around every corner.